The service is available both in Italian and in English (the entire site has been translated and published in English version, it is not a web-translation but a site originally in English). The archive is unified. 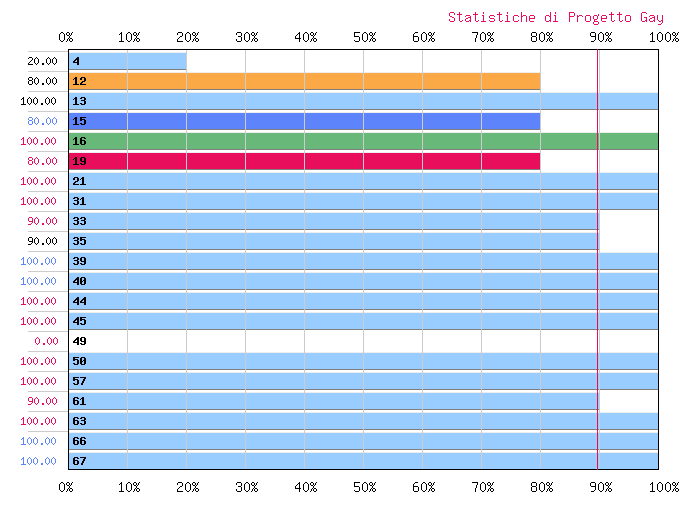 As for the interviews, on the same DB are then stored interviews both in Italian and in English. These interviews can be easily selected through the search function. The DB of tests of sexual orientation is encoded. Each card is compiled in Italian or in English, is encoded and can be read (decoded) in both Italian and English, regardless of the language in which it was compiled. The service has been greatly improved, there is now the option to see the preview of the analysis in order to change the answers before final posting, and have also been improved techniques for avoiding repeated posting. The test has been created with very serious scientific criteria explained in the methodology page, shown in the page that contains the response processed by the system. Below you can read an example of test with its response card. The first analysis of the form above tends to evaluate the sexual orientation that comes out from the complex of the test. Some answers are neutral, i.e. don't allow any deduction covering sexual orientation, others are more or less significant. The program first evaluates the significance of the answers in terms of identification of sexual orientation and distinguish answers on the basis of the reference context. In the form under analysis have been identified 21 significant responses in terms of sexual orientation, of which 12 relating to sexuality, 5 relating to affectivity and 3concerning the social dimension. The system then determines the "gay individual number" which is a measure of the general significance in the gay sense of the answers. This "gay individual number" can be compared to the "maximum gay number" that is, with the greatest measure of gay trend coming from questions to which the user gave a significant response (not neutral). The "maximum gay number" is variable and depends on the greater or lesser presence of neutral feedback. 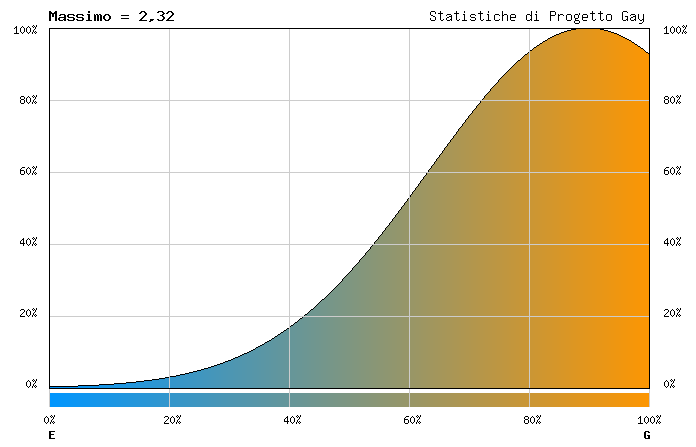 What is really significant is the percentage of "maximum gay number" totalized by the user, we call it "general gay index", if the general gay index is equal to 100%, the user answered as a 100% gay person, if the percentage is equal to 0%, the user, answered as a 100% straight. The following table assists in the classification of the sexual orientation in relation to the IGG. As in any schematization of complex phenomena, should not be forgotten that the definitions have a relative value, albeit tentatively useful. The following table assists in evaluating the effectiveness of the responses used in the calculation of the IGG. 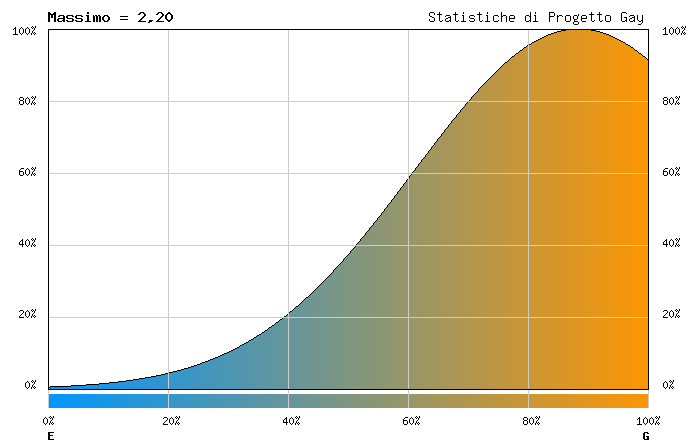 We have to take into account that in a distribution with values from 0 to 100, the SQM maximum is equal to 50. In the present case it can be concluded that the indicators of sexual orientation expressed in the test result fairly consistent. An overall representation of the responses to test indicative of sexual orientation can be seen in the following histogram. each column is marked with a number indicating the question to which refers the individual assessment. A hetero orientation to 100% is characterized by bands all zero (percentage gay = 0). A 100% gay orientation is characterized by bands almost all extended up to 100%, not exactly all, why certain questions still leave a margin of uncertainty. In numeric column on the left you can see the percentage of gay orientation emerging from each answer. The red numbers indicate that the corresponding answers are relevant to sexuality, the numbers in blue indicate that the answers are relevant to emotion, the numbers in black indicate that the answers are relevant to socializing. The red vertical line indicates the IGG. Of more immediate intuitive meaning is the following diagram, which graphically represents the average distribution of the individual indices derived from each significant question in a gay scale graduated from 0 (point "E" totally hetero) to 100 (point "G" totally gay ). The abscissa of the vertex of the curve represents the IGG, the more the curve is sharp the smaller is the value of the SQM. It should be noted that high values of SQM produce curves very flat and therefore not very significant in terms of identifying sexual orientation. Very sharp curves i.e. with small SQM are very significant in terms of identifying sexual orientation. 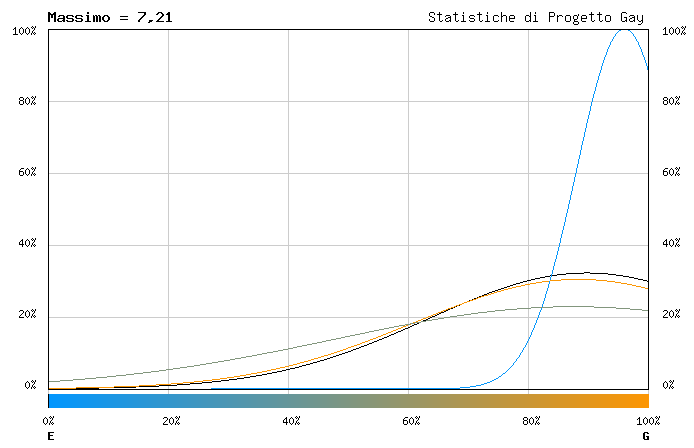 To make always possible to the graphical representation, when the SQM is <1, is automatically reset to 1. 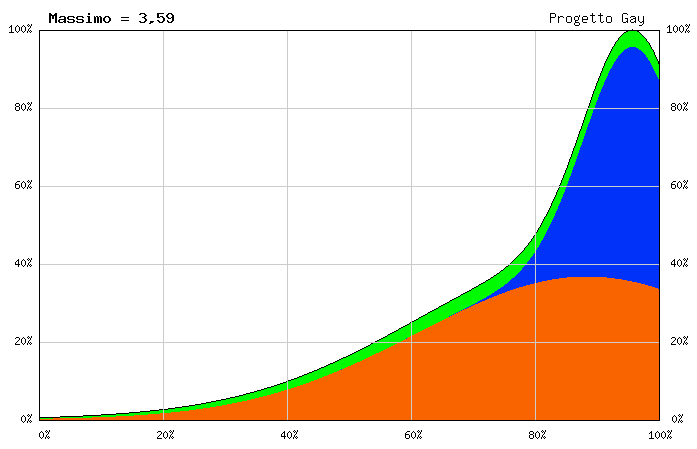 Because of graphical needs the graphic distribution curves have been normalized over the interval [0, 1] then all the areas included under the curves are equivalent to the unit and the scale in the ordinate is a percentage of the maximum, even if the maximum is indicated in each graph in the top left, given the difference in scale in the ordinate between the three graphs, it is not easy to perform a visual comparison. The following chart shows the three previous graphs in the same scale, i.e. as a percentage of the maximum of the maximums of the four functions, making possible thy way to make a direct comparison. The curve black color represents the distribution of sexual orientation overall, the one blue color is related to affectivity, the one orange color is related to sexuality and the one green color to socializing. For the interpretation of this graph is good to keep in mind that because the gay general index is strongly related to sexuality between the curve of sexual orientation in general and that related to sexuality, usually, there is not a big difference, instead occasionally it happens that the affective curve differs substantially from the general one, this could be due to a separation trend between affectivity and sexuality. Differences even more evident can be observed between the general curve and the one related to socializing. To allow a quantitative comparison we introduce the variable DS-A = IGS - IGA. If the index is positive physical sexuality is geared more strongly towards gay than affectivity. In general, a significant difference between affection and sexuality and a DS-A of absolute value greater than 15 is a sign of discomfort. To make an overall evaluation, you have below a summary table showing the scoreboards already seen that we report here for convenience. Overall assessment strictly gay. General indicators are fairly consistent. Sexuality strictly gay. Sexual indicators are fairly consistent. Affectivity strictly gay. The affective indicators are strictly consistent. Sociality strictly gay. The indicators of socialization are strictly consistent. Assessments of affectivity and sexuality fairly consistent. Determined as above average parameters and also determined the standard deviations of the three components (affective, sexual and social), we can draw a graph of sexual orientation that takes into account the three components, that is, the so-called "additive" graph, a linear combination of the three previous graphs with standard coefficients 0.6 for sexuality, 0.3 for affectivity and 0.1 for socializing. The coefficients are assumed to a first approximation equal to 0.6, 0.3 and 0.1, values chosen on the basis of measurements made on a large sample of questionnaires. The coefficients 0.6, 0.3 and 0.1 are called average coefficients that is, those that best adapt to the average situation of the population. The individual perception of the sexual orientation can also be "different" from the average and may be represented, at a later stage, changing the weight of the components (sexual, affective and social) of the sexual orientation in relation to the assessment of actual sexual, affective or social discomfort. For the moment confine ourselves to the representation of sexual orientation using the average coefficients. The sexual component of the general sexual orientation is represented red color, the one related to affectivity blue color and the one related to sociality in yellow color (green). 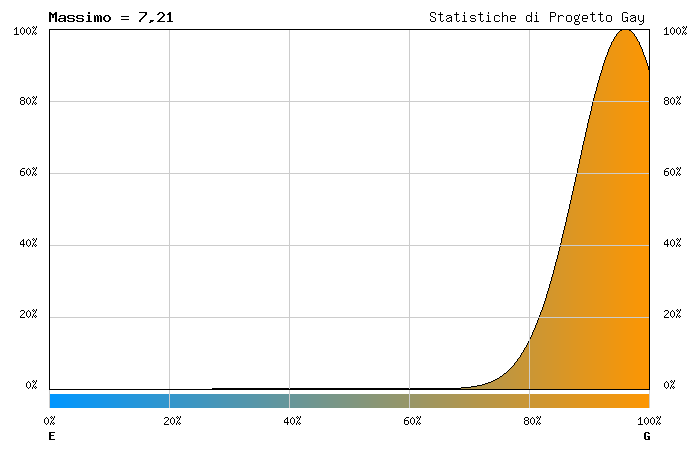 X-axis we have the gay sexual orientation in % and in ordinate the density of probability. Particular attention must be devoted to the interpretation of the "additive diagram " above in cases where the affective polarization, i.e. the area of maximum densification of the blue component of the diagram, is significantly distant from the zone of polarization of sexual zone (red). It is a situational of significant discomfort. In these cases the maximum of the curve may depart significantly from the IGG and may also appear a second maximum in the curve. The appearance of a second peak in the additive diagram indicates the separation between sexuality and affectivity. To the question "How do you perceive your sexual orientation? "; you answered "At the beginning I also had a straight period but now I feel much gay" to this answer is attributed a gay index of 80, from the test results an IGG equal to 89.71 . Your perception of your sexual orientation can be considerd very precise.